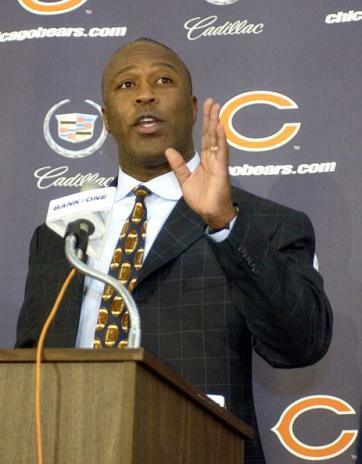 Lovie Smith was the third-longest tenured Chicago Bears coach in their 93-year history. Here he addresses the press, undoubtedly with condescending and belittling comments. An air of change, perhaps never before seen in the 93-year existence of the Chicago Bears organization, settled into Halas Hall in January 2012. Perhaps the major change in 2012 would have been limited to one, had the Bears continued the prosperity they enjoyed during a 7-1 start to the season. But they didn't. After the 7-1 start, when the Bears led the NFC North Division and seemed to be an absolute playoff lock, the team finished 3-5 down the stretch. On December 31st it was announced that ninth-year coach Lovie Smith, who had reportedly turned down a two-year contract extension earlier in the season, was fired. Certainly no Bears fans expected major changes to occur in January 2012. Clearly the Bears had finished the 2011 season on a disappointing note, dropping five of their final six games in embarrassing fashion after having started the season 7-3. Absent were any calls for the head coach's head, which is a common theme in Chicago after bad Bears seasons. After all, the poor finish came only after quarterback Jay Cutler and later running back Matt Forte were lost for the year. But Bears management had stunning news for the public on January 3rd, when they announced that General Manager Jerry Angelo was being fired after 11 years running football operations for the team. A series of failed top draft picks, the incompetent play of Cutler's backup Caleb Hanie, and the continued strength of Green Bay (and the resurgence of Detroit) were cited as reasons for the dismissal. Thankfully there would be no hiring of an executive search firm to select the new GM as there had been in 2001, but Bears President Ted Phillips did announce that a thorough search would take place. Candidates that would be discussed to replace Angelo included Jason Licht from New England, former Bears scout Phil Emery from Kansas City, Baltimore's Eric DeCosta, the New York Giant's Marc Ross, and (curiously) for a time, incumbent Bears VP of Pro Personnel Tim Ruskell. After what turned out to be a 27-day search, the Bears introduced Emery as only their third General Manager since George Halas ran the team from his deathbed in 1983. At the same time Angelo's firing was announced, Lovie Smith took the podium to explain that offensive coordinator Mike Martz had "retired." It was immediately speculated that the simple departure of Martz would improve the Bears' offense in 2012. Shortly thereafter, Bears offensive line coach and former Vikings head coach Mike Tice was promoted to the role. Tice stated that his offense would create a moving pocket for quarterback Jay Cutler and feature downfield throws. After just six weeks with the Bears, Emery made the first news of NFL's free agent period when he boldly traded two third-round draft picks to the Miami Dolphins for talented but sometimes troubled receiver Brandon Marshall. Just days later, it was revealed that Marshall had been involved in an altercation in New York, having been accused of striking a woman in a bar. Marshall ultimately was not charged in the incident, but after troubles involving Bears such as Cedric Benson and Tank Johnson, Bears fans had the right to be nervous. The trade for Marshall was made possible because of the extra third-round pick they had acquired from the Carolina Panthers for tight end Greg Olsen in 2011. Olsen's absence was not conspicuous in 2011 as the Bears were still running Mike Martz' offense, which neglected to utilize the tight end. But in 2012 they were expected to involve the position more under Mike Tice, and were left with the extremely inconsistent Kellen Davis. It was hoped that Davis with his perfect tight end body would finally flourish. Emery had immediately signaled that he was serious about filling some of the glaring holes on the Bears roster-Chicago had lacked a bona fide threat at wide receiver for years. Perhaps decades. And obviously Emery would take the unconventional approach when necessary. After the Marshall splash, the Bears were fairly conservative in free agency. Their biggest moves were in signing more competent backups at quarterback and running back in Jason Campbell and Michael Bush from Oakland. In the 2012 college draft, the first time Emery would be in control of the selection process, all bets were on the Bears selecting a pass rusher. And plenty of pass rushers would be available in this draft. By the time the Bears were on the board with the 19th overall pick, just two of the five that would be picked in the first round had been selected. The Bears had their choice of several quality players, including Illinois DE Whitney Mercilus, Syracuse's Chandler Jones, another DE, or offensive linemen such as Stanford's David DeCastro or Iowa's Riley Reiff. But Emery stunned a bit by selecting Boise State DE Shea McClellin. In the second round, Emery traded up to select tall wide receiver Alshon Jeffery from South Carolina. Safety Brandon Hardin was the third-round pick but spent the season on injured reserve, and Temple fullback Evan Rodriguez rounded out picks that would contribute as the fourth-round selection. Two main stories emerged as training camp opened. The first was the battle at left tackle, along with the overall state of the much-maligned offensive line. Third-year incumbent J'Marcus Webb was given competition at LT from 2008 first-round pick Chris Williams. Webb won the job, and Williams would be released outright just into the season. Incumbent left guard Chris Spencer also battled free agent signee Chilo Rachal, with Spencer initially winning. Center was to be handled ably by 12-year vet Roberto Garza, and the right side was set with Lance Louis at guard and Gabe Carimi at tackle. Another feeling at training camp, with the additions of Marshall and Jeffery at receiver and the subtraction of Martz, was that the Bears defense's play would slip while the offense carried the team. There was concern over the health of MLB Brian Urlacher's knee, which he had injured in the final game of 2011. If the aging defense could just play competently while the offense broke out, perhaps the 2012 Bears would have a chance at greatness. Or so it was thought. On opening day, the Bears faced the Indianapolis Colts with budding star quarterback Andrew Luck, the first pick in the 2012 draft. In the team's finest overall performance of the season, they pasted Luck and the Colts by the score of 41-21. The win featured five Bears takeaways-three interceptions of the rookie along with two fumble recoveries. The game was capped by a 42-yard touchdown strike from Cutler to Jeffery, the first of many long touchdowns that would be scored by the offense. Or so it was thought. The season's second week sent the Bears to Green Bay on a nationally-televised Thursday night, where the Bears were roundly embarrassed. Marshall, who had caught nine passes for 119 yards and a touchdown, was shut out in the 23-10 loss. Green Bay's pass rush seemed unstoppable. The Packers' Clay Matthews Jr. led the charge with 3.5 sacks, and the Bears gave up seven total. On a night when the Bears defense kept Aaron Rodgers largely in check, Chicago could only muster 168 yards of offense. The Bears recovered nicely from the terrible effort at Green Bay by playing their best stretch of football of the season-perhaps their best stretch since 2006. Chicago won their next six games to lead the NFC North by a game with a 7-1 record. The stretch included impressive wins over Tennessee (51-20) and gritty victories at Dallas (34-18) and against Detroit (13-7), both on Monday Night Football. The Bears aging defense dominated during the stretch, scoring five touchdowns on their own. Cornerback Tim Jennings became the NFL leader in interceptions, a lead he would not relinquish. The Bears were 7-1, and it was assumed that with just three more victories in the final eight weeks the Bears would make the playoffs. Four or five would certainly give them the division title and a bye. Or so it was thought. In the season's ninth game, the Bears began playing the more elite teams in the NFL, including Houston, San Francisco, Minnesota twice, and the rematch with Green Bay. Once the good teams started arriving on the schedule regularly, the bottom fell out. The first loss at home to Houston, in which Cutler was lost to a concussion, was not alarming, being to an AFC team. The Bears then went to San Francisco and were embarrassed by quarterback Colin Kapernick in his first start. The Bears rebounded to beat Minnesota at home, but then lost three critical games in a row to NFC contenders Seattle, Minnesota and Green Bay. During this stretch the Bears also lost key players for the year in Urlacher, kicker Robbie Gould, and right guard Louis. Following the 21-13 loss at home to Green Bay, while the Bears were not officially eliminated, their destiny was taken out of their hands. The Packer loss was the sixth straight to their hated rivals, and the eighth of the last 11 matchups for Lovie Smith, who committed to beating Green Bay as his first priority when he was hired. Or so he promised. The Bears did all they could to make the playoffs in the season's final two weeks by beating bad Arizona and Detroit teams. But after the Bears' tenth win at Detroit, they learned several hours later that a Viking win over the Packers had eliminated them from playoff contention. In the end, despite the hope for an offensive breakout, the unit finished ranked 16th overall and 29th in passing. They were frequently forced to burn timeouts due to problems getting plays in and looked generally disorganized much of the time. While Marshall had a record year for a Bears receiver, no other players were consistent threats. Thus if opposing defenses took Marshall out of the game and shut down the run, they had nothing to fear. Clearly a change to this offensively-challenged team was in the works. It is not often that a head coach is fired following a ten-win season, especially a coach that had led his team to winning records in five of nine seasons, hosted two NFC Championship games, and played in one Super Bowl. But early in the morning following the Viking win over the Packers, it was announced that Smith had been terminated. Not possible, so I thought. Quote of the Year: "Two of the people I don't care about: fans or media. They don't know what they're talking about, obviously. The only team in our division that gets booed at home is us. It's incredible to me." -Yes, he actually said it. Brian Urlacher on his true feelings about and for his fans. Passing: Jay Cutler started 15 games in 2012, and I would venture to guess that his 56 starts as a Bears quarterback put him near the top at the position all-time. Cutler threw for 3,033 yards in 2012 with 19 TD's, 14 INT's and an 81.3 rating. Rushing: Matt Forte led the team for the fifth straight year, totalling 1,094 yards on the ground with five touchdowns. Receiving: Brandon Marshall became the first Bears receiver in the Pro Bowl since 2002 with his historic performance. He caught 118 passes for 1,508 yards and 11 touchdowns. Scoring: Robbie Gould continued the Bears tradition of scoring being led by a kicker. He scored 96 points on 21 field goals and 33 extra points. Sacks: Julius Peppers led the Bears with 11.5 sacks. Third-year player Corey Wootton had a strong season as well with seven while he played relentlessly. Interceptions: Tim Jennings led the NFL in interceptions with nine, becoming the first Bear to do so since Mark Carrier in 1990. 2012 Chicago Bears usual starters. Left to Right: Offense Jay Cutler, Matt Forte, Brandon Marshall, Devin Hester, Earl Bennett, J'Marcus Webb, Chris Spencer, Roberto Garza, Lance Louis, Gabe Carimi, Kellen Davis, Robbie Gould. Defense Israel Idonije, Henry Melton, Stephen Paea, Julius Peppers, Lance Briggs, Brian Urlacher, Nick Roach, Charles Tillman, Chris Conte, Major Wright, Tim Jennings, Adam Podlesh. Many thanks to Matt Slater who provided this sidebar! Many of us will remember former Viking head coach and one-and-done Bears offensive coordinator Mike Tice infamously creating the "Randy Ratio" in 2002. The proclimation was a failure, as the Viking offense focused too much on Moss, to the detriment of the offense's success. FROM THE OFFENSIVE COORDINATOR WHO BROUGHT YOU “THE RANDY RATIO”…. 40% OF BEARS PASSES ARE INTENDED FOR MARSHALL. 41% OF BEARS COMPLETIONS ARE CAUGHT BY MARSHALL. 46% OF BEARS PASSING YARDS ARE COMPILED BY MARSHALL. 38% OF BEARS INTERCEPTIONS ARE INTENDED FOR MARSHALL. 46% OF BEARS FIRST DOWN RECEPTIONS ARE MADE BY MARSHALL. 52% OF BEARS PASSING TOUCHDOWNS ARE SCORED BY MARSHALL. 72.8 PASSER RATING WHEN THROWING TO ANY OTHER RECEIVER!! Kudos to Brandon, but how about a little balance? The 2012 Chicago Bears once again served as the poster team for offensive futility, for all intents and purposes. But lost in the mainly disappointing offensive season were several notable accomplishments. First, of course, was new WR Brandon Marshall's record-breaking performance. Marshall shattered the Bears' season record for receiving with 118 catches (record) for 1,508 yards (record) and 11 touchdowns (two short of record). Marshall made the Pro Bowl and was a first-team AP All Pro. As a matter of fact, with just three more similar seasons Marshall would become the all-time Bears leader in receiving yards (and would need just two more to lead in receptions). These marks would smash Johnny Morris' record which has stood for 45 years, and it took Morris ten seasons to achieve those numbers! Quarterback Jay Cutler remains the Bears all-time leader in quarterback rating with 81.3, despite the many interceptions he has thrown thanks in part to the poor offensive line continually employed to protect him. Cutler leads the Bears all-time in number of 3,000+ yard seasons with three, and given a healthy year in 2013, Cutler will become the Bears' all-time leader in passing yards after just five seasons with the team. Cutler currently trails Sid Luckman, who last played football in 1950, by 2,394 yards. Matt Forte rushed for 1,094 yards, his third 1,000 yard season as a Bear. Forte was rewarded with a four-year, $32 million contract prior to the 2012 season. While the Bears offense had just a few diamonds in the rough, the defense had one of its finest seasons since the Buddy Ryan era. Its overall ranking was fifth in yards and third in points allowed. The unit set a franchise record for touchdowns scored in a season with eight. Defensive end Julius Peppers again made the Pro Bowl with 11.5 sacks, and was joined in this honor by tackle Henry Melton, who ably replaced Tommie Harris as the Bears' critical three-technique lineman. For the first time since 1988, a team will have two starters at cornerback in the Pro Bowl with Tim Jennings and Charles Tillman gaining these honors. Tillman's 2012 season, his tenth, was one for the ages, even if his statistics don't stand out (most cornerbacks are honored for interceptions only). Tillman became the Bears' all-time leader in defensive touchdowns scored when he notched his eighth against Tennessee. He set an NFL record for forcing four fumbles in the same game. In addition to being honored as a Pro Bowler for the second year in a row, Tillman was also named an AP first team All Pro for the first time. Bears players' frustrations boiled over while they were losing, and frequently they seemed to take out their anger on Chicago fans. Early in the season, Jay Cutler became frustrated that the home crowd is too loud while the Bears are driving on offense and need quiet, and after becoming visibly upset and later admonishing the fans in the media, the crowd actually quieted down going forward. Brian Urlacher made the statements that he doesn't care what any fans think, which is nothing new as he had previously been on record saying he could "care less" what fans think. And following Lovie Smith's firing, kickoff returner and imposter wide receiver Devin Hester blamed the firing on "false fans." Hester had probably his least successful year as a kick returner, failing to return any for scores and frequently running sideways and backwards on punt returns. And his performance on offense was the lowest of his career since being switched to receiver in 2007. He caught just 23 passes for 242 yards and one touchdown (a great diving catch at that.) Much was made about the Bears' signing of a competent backup quarterback in Jason Campbell, but he did not delight when he did play. In relief of the concussed Cutler against Houston, he could only muster 94 yards passing. In his start the following week at San Francisco, he threw for just 107 yards in four quarters, threw two interceptions and was sacked six times-five and a half by the 49ers Aldon Smith. Following the San Francisco game, left guard Chilo Rachal was benched. Rachal had supplanted Chris Spencer earlier in the season. But following his benching, Rachal quit football. Had he hung in there he would have found a place back in the starting lineup when Lance Louis was lost for the season in the Viking game. Tough timing for Chilo. Finally, famous Bears PA announcer Jim Riebandt, of "THERE'S A TIME OUT. WHERE? ON THE FIELD!" missed his first game in 30 years against Houston due to a work commitment. Riebandt was replaced in the booth for one night by Iowa's Gary Dolphin. Traded 3rd round picks in 2012 and 2013 to Miami for WR Brandon Marshall. Traded 2nd and 5th round picks to Rams to move up five spots to draft WR Alshon Jeffery in 2012 draft. Traded 2013 seventh-round pick to Tampa Bay for DT Brian Price.